in whatever condition you find yourself today, Jesus Christ will make you whole. If you are in a state of joy, he will give you life abundant. If you find yourself going through trials in your life, he will offer you a way out of the wilderness. Whatever you truly need, he has promised to help you find it. He has called himself "I AM" and this is the best name he could have taken for whatever need you have, the great I AM is able to bring it to you. Do you need deliverance? The great "I AM" can provide that to you. Do you need healing? He will also do that for you. The good news we have to share with you is that because he has done this for us, he will also do it for you. The articles and messages found on this site were compiled to help you through the trails of life and into holiness and righteousness without which, no one will be able to see God. May you truly find blessing for your life today in Jesus name. Please join us the last Friday of every month for international fellowship at 7PM CST. 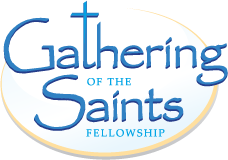 Copyright © 2013 Gathering of the Saints Fellowship. All Rights Reserved.